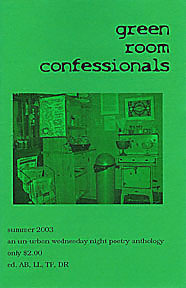 Green Room Confessionals is the first compilation of some of the poets who perform at the Un-Urban Coffeehouse. Poets featured in this issue: Dean De Benedictis, Adam Bresson, Marilyn Charleston, Kim Cochran, Nigel Dandridge-Perry, Mike Dias, Kip Garwood, Marie Lecrivain, Ray Lanthier, Laura Lionello, lovemando, Patrick Mooney, Lawrence Moreno, Dave Nordling, Doug Richardson, Tim Sexauer, Jack Shafer, Elizabeth Shales, Franceye Smith, Mani Suri, Dave Wheeler, and Gregory T. Young. Stay tuned for the next issue!